• Kidney transplantation is an integral part of Nephrology. Indeed, nearly 50% of patients with primary kidney failure live with a kidney transplant in Europe. Therefore, increasing kidney transplantation visibility and disseminating its knowledge may benefit the whole nephrological community. • The knowledge about kidney transplantation and current standard practices in kidney transplantation varies between European countries and nephrologists and objective, unbiased educational activities may help to further increase the post-transplant outcome in European patients. • In Europe several research groups dealing with renal transplantation exist. Their activity can benefit from a mutual exchange of knowledge and expertise liaising with a structured working group. DESCARTES WG has established the following educational priorities to promote pre-emptive transplantation and to stimulate living donor transplantation. The rationale is threefold: improving pre-emptive transplantation from living donors is a crucial step that may contribute to prevent organ shortage, and improve transplant rates and patient outcomes. In addition, general nephrologists (target audience for the DESCARTES educational activities) are those who can direct their patients reaching terminal kidney failure to pre-emptive living donor transplantation. DESCARTES in collaboration with European Renal Best Practice (ERBP) worked on guidelines for pre-emptive living donor transplantation which have been submitted for publication See more at: PUBLICATIONS. 2. To promote and develop both clinical and biological research in the field of kidney transplantation, with the aim to improve patient outcomes. DESCARTES major plan is to set up clinical trials whose main characteristics are: 1) to focus on unambiguous, meaningful clinical endpoints; 2) to include estimates of cost and cost-effectiveness; 3) to set up trials with sufficiently long follow-up time; 4) to enrol patients that are usually excluded from industry-driven clinical trials; 5) to provide a network of clinical trial sites for future translational research projects. The current tentative topic for the first clinical trial of the DESCARTES WG is a randomized controlled trial of immunosuppressive therapy in the elderly, a field where sound, robust data are still lacking. At a later stage, other projects combining clinical and biological research will be considered. 3. To foster communication between members with related research interests, and to collaborate when possible with other ERA-EDTA working groups. 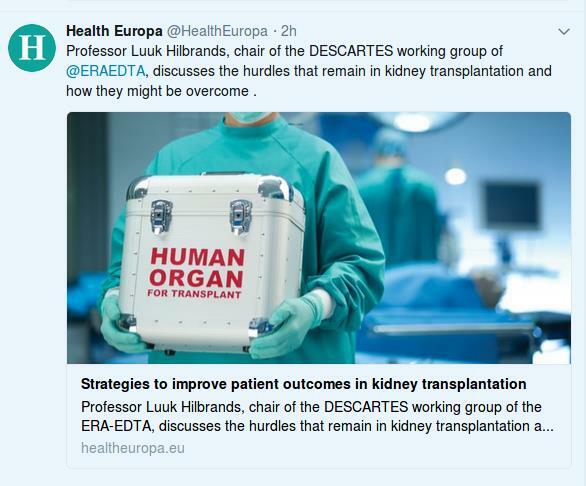 DESCARTES has deliberately started collaborating with ESOT (European Society of Organ Transplantation) in order to join forces in terms of guidance (education) and science in the field of renal transplantation in Europe. DESCARTES is also planning to coordinate its activity in close relation to the already existing ERA-EDTA working groups (i.e. Immunonephrology Working Group and the Working Group on Inherited Kidney Disorders). DESCARTES collaborated with the ERBP advisory board concerning the creation of a guideline on pre-emptive transplantation. In summary, DESCARTES has the ambition to contribute, through education and research, to the improvement of the care of renal patients and especially of patients living with a kidney transplant.